It's on! Deadland Ritual, the new supergroup featuring former Black Sabbath bassist Geezer Butler, ex-Guns N' Rosesdrummer Matt Sorum, Billy Idol guitarist Steve Stevens and Apocalyptica and Scars on Broadway vocalist Franky Perez, will be hitting the road. for sure. but this song is..........not very exicting !!! What has Raj done precisely? Slash's brother sounds like an absolute bellend. It seems that the guy criticized the price (USD 1000) of a signed artwork, something like that. Ash actually comes out as funny and disrespectful. Fanboy = ment to be a diss at someone who devoted part of his life to promote Slash (Ash's brother)? Ment to diss ppl who support his brother? a) w/o the fans any musician out there would be = 0! Who is buying albums, tickets, magazines promoting them, merch? b) Ash should accept that he doesn't own Slash in any shape or form. Nobody will steal his brother from him. He should grow up and act according to his age. Furthermore, not be frustrated with ppl supporting his brother, but support the ones that support his brother and appreciate them. I was with him when he went on the rant regarding the current line up, but this is a misshit and makes him look like a spoiled brat. p.s. 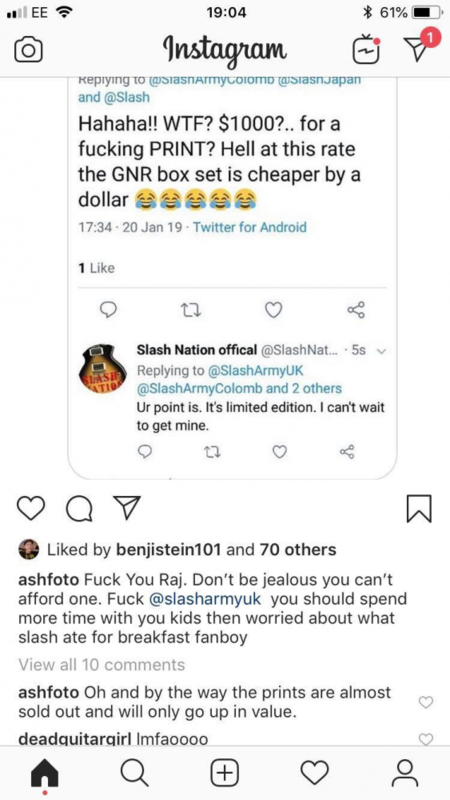 I thought he partially designs the stuff Slash releases? ie. he is spitting on the ones that partially feed him. 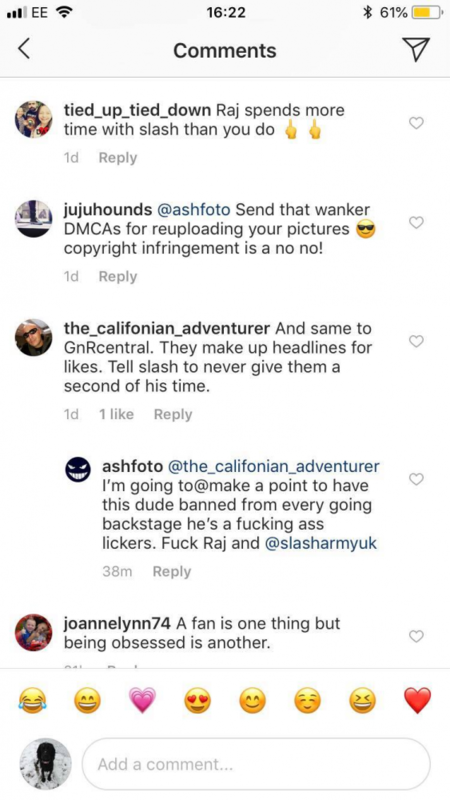 Well Ash is just ''famous'' for being somebody famous's brother, so he has a nerve criticising people for the level of their fandom. 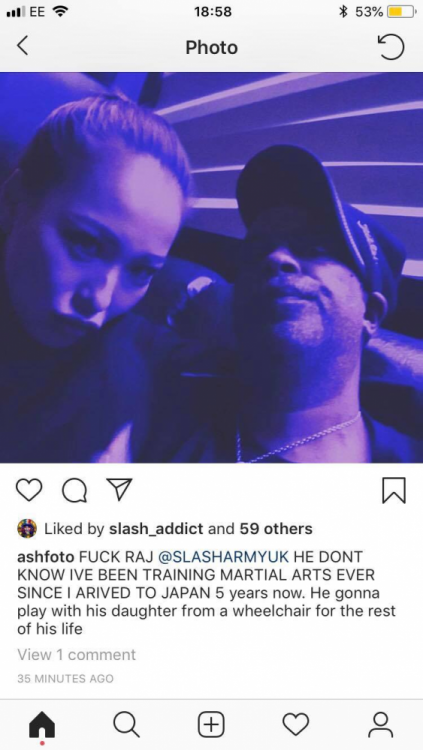 Is Ash making a physical harm threat saying he's been doing martial arts? 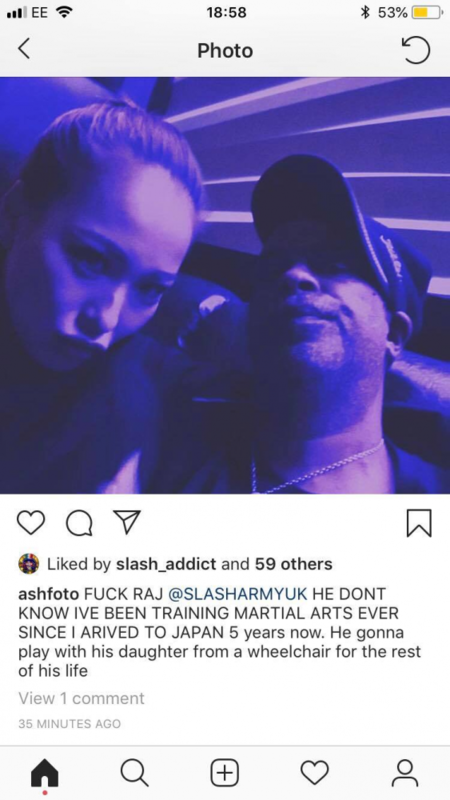 I find it very funny when celebrities or hangers on (Ash) read comments and feel compelled to comment back on the negative comments. Ash seems to have his own little fan club judging by those instagram pictures. He is completely different that Slash is, Slash is.a very chill guy. Even when Slash is drunk he'd usually just pee his pants and pass out. @frontman you make my day !!!! Slash pee his pants with class...he is a british guy, true Sir.. I have visions of a drunken Ash trying to do his Karate moves against miscreant fans during Slash's upcoming tour. Just giving my professional opinion as Im also a designer: Ash is terrible at it. He probably get jobs because he's Slashs brother. Slash is a thousand years ahead of his brother on what comes to art (or at least used to). A thousand bucks for a print of Ashs work? No, thanks.